Heat a tbsp of ghee and roast the rava over low heat till it changes color to light brown and you get a nice smell of roasted rava. 1.Heat another tbsp of ghee and fry the raisins, cashew nuts and almonds till raisins puff up and the nuts change color slightly. 3.Then add the roasted rava and mix well. Add sugar, cardamom powder and roast for a few more minutes. 4.Switch off the flame, add milk little by little and keep mixing it well. If you are able to make ladoos, stop adding milk. When the heat is bearable, divide mixture into equal parts and make small balls out of it. Rava Ladoos are ready. Store them in an airtight container. Since we have added milk, these ladoos can be stored only for 2-3 days. It was very tasty, soft and divine and just melted in our mouths. Heat 2 tsp of ghee and roast rava over low flame till you get a nice aroma of roasted rava. Now grind the rava to a coarse powder and the sugar to a fine powder. Take 1 cup of this coarsely powdered rava, 1 cup of powdered sugar, cardamom powder and mix it well with your hands. Heat ghee well and mix little by little to the rava+ sugar mix and make balls when hot. (when your hands can bear the heat). Do not pour all the ghee to the mix. I did not need the whole 1/2 cup of ghee, I used a little less. Note -My view is that, if you powder rava finely, it will not be easy on your throat, so it is advisable to powder it coarsely. If the ghee has become cold, instead of re heating, keep it over a bowl of boiling water. 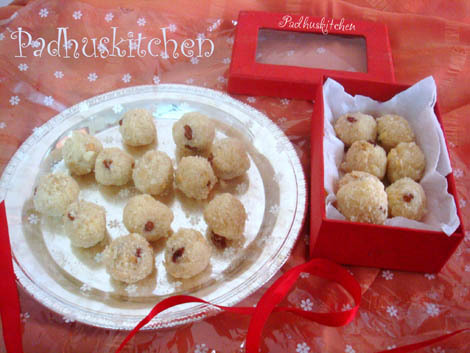 These Home made Sooji ladoos make Perfect gifts for Diwali. All the variation are tempting,as festive season is on in my town I am sure to make this! Nice recipe...Looks very very yum! what a sweet recipe that is.looks divine. This Rava laddu luks invitingly good.I will try the first one since the second method has been tried for years. wow they look so delicious and yummy pictures !!!! Yum ....looks so delicious ...one of my fav. wow....rava ladoo looks absolutel yummy. nice presentation. My mom makes rava laddoos without milk too and I loooveee them!! But I adore the one with milk..They turn out soft & yummy!!! Love these. Looks perfect and yummm. super delicious ladoos. love to try these. I'm just loving your blog very much. I live abroad and I miss mom-made food every single day. I accidentally came across your blog while I was searching for some easy recipes for Diwali and I'm really glad I found your blog :). All your recipes are really well explained and the illustrations are just so great. Hats off to your patience and creativity. I'm book marking the blog right away bcos I'm sure I'll be coming back very often :). All the best and keep up the good work :). Happy diwali!!! Thanks Padhu... nice recipes... My laddus aren't too tight.. they break.. probably because the heat wasn't sufficient.. do you know if this can be fixed now? if so, could you tell me how? Hey even i tried making Rava Laddoo.. n U r correct they are a perfect gift for any ocassion..
Sorna lakshmi- Milk is boiled but at room temperature. thanks for your recipies,being an iyengar...i need all the help to make these delicacies for gokulashtmi! as iam away from my mother and mil. The recipes given r just bravo love ya. dear Padhu, my grand mother used to makerava ladoo in a totally different method . she made something like upma then made the ladoo . any idea how it is done? thank u very much dear padhu. every thursday i offer prasad to lord shiva. ur receipes help me lot while preparing sweets. Awesome. Just tried it. Came out awesome! Nice recipes.should the milk used here should be boiled the boiled milk or pain milk? Boiled lukewarm milk. Sorry I could not reply to you immediately as I was taking a break after Diwali work. I just tried rava ladoo it came out really good.thank you very much.can you please post on methi leaves receipes as I stay in abroad and I get only these leaves. Hi Padhu, first time i prepared this rava laddu,which has come a gr8 taste with the help of your recipe. Thanks a lot!! I tried the variation of the recipe without milk and coconuts. I was skeletal as to how I might be able to make the mixture into ball-shaped laddus. But I was surprised that it came out easily and neatly. My give year old daughter loved the rava laddus which I made using your recipe. Thanks! You are doing a wonderful job by guiding youngsters with awesome recipes to cook!!! I have tried many of your recipes from rava ladoo, Black Forest cake, apple cake, oats cake,Badam halwa, ragi adai .....it goes on!! All the recipes have always been hit in my friends circle. Continue your good work and inspire more people to cook...Thanks!! 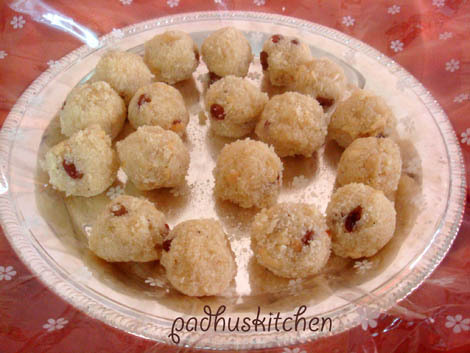 Hi Padhu, i tried making ladoos, (your moms version) but i wasn't able to make the balls. They were so fragile and would break into pieces with a single touch. What could have been the problem? With warm ghee you will be able to make balls. You can add more ghee if you are not able to make balls. Another reason can be that the rava might have been too coarse. Hi... thnkz a ton for both the methods of making it we iyengers make it the second way but since am nee to it i culdnt until i saw ur blog and reciep ... i really thnk u a lot ..